Do you consider yourself to be a bit of a ‘Handy Man’ or know someone obsessed with DIY projects? These days it seems we can do almost anything ourselves with a bit of ‘Googling’ and a few Youtube videos. But don’t they make it look so easy in the videos and in reality when you try doing it yourself, the results are never quite the same. I think it’s safe to say that not all things should be fixed with a quick DIY search on Google, especially the meticulous job of repainting your own vehicle. 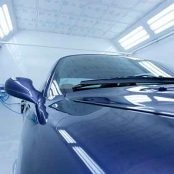 Sometimes you need to go for the safe and hassle-free option, which in this case would be to take your vehicle to an auto body shop for a professional repaint, which would be carried out in a spray booth. Controlled Environment. There are a few common factors that can affect the finish of your vehicle’s paint job, such as temperature, humidity and dust. There are a few common factors that can affect the finish of your vehicle’s paint job, such as temperature, humidity and dust. Controls Hazardous Materials. Hazardous chemicals found in automotive paints and other materials used in the repainting process release fumes and particles that can both harm your health and the environment. The advantage of a spray booth is that it filters these chemicals, to ensure they don’t pose a threat to the surrounding areas. Dust-Free Surroundings. If you eliminate dust floating about, you allow for an immaculate paint finish to be achieved. The lack of dust will lead to an even coat of paint, without any flecks of dust or debris landing on the wet surface. It can also result in an increase in the durability of the paint and coatings. Longer-lasting Finish. The controlled environment allows for a more stable application of the paint and coatings, which in turn will increase its durability. 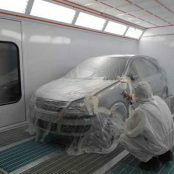 By maintaining the air temperature, an even layer of paint can be applied to the vehicle, resulting in a smooth finish. In addition, these controlled conditions allow the paint and additional coatings to bond together well, creating a strong coat. It never hurts to invest in a good paint job for your car; a paint job done properly is better than a do-it-yourself one that may not result in the expected finish. Over time, the value of your vehicle will depreciate. The condition of your car’s overall look is one of the things that will be assessed if you were to trade-in or if you intend to privately sell it. If the colour of your vehicle has turned dull prematurely, it’s often due to being parked under direct sunlight quite often… UV from the sun breaks down the lacquer coat protection over time and eventually, it will start to fade. For awesome paint job for your car, check out how Bodyteq has transformed these vehicles! Consult and check in your vehicle today!